Marina Biograd is located just south of the city of Zadar on the north-central Dalmatian coastline and is an excellent starting point for sailing in Croatia. Should you choose to sail north from Marina Biograd you will quickly reach the island Pag, which has varied scenery and stunning views. By sailing slightly further north, you will reach the Kvarner region, which is a relatively unexplored sailing area. In Kvarner you will find a beautiful archipelago dominated by the islands of Krk, Cres and Losinj, where small, cozy communities will be competing for your attention. Kvarner is also one of the few protected areas for bottle-nose dolphins, which are often seen swimming, playing, and racing with bobbing sailboats during your yacht charter in Croatia. 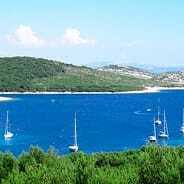 You may instead choose to sail south of Marina Biograd, and if you do you will find some of Croatia's most popular national parks; Kornati and Krka. The Kornati islands are surrounded by a swarm of smaller, completely barren islands, which give them a rather surreal dimension. For those who enjoy Croatia sailing in a pristine archipelago with countless natural bays, the Kornati islands will be a dream come true. The islands are densely packed and the area is easily sailed. 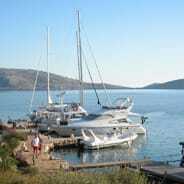 Marina Kremik position is a perfect starting point in the middle of Croatia's most interesting sailing area. The port is an ideal base for sailing in the northern Dalmatian archipelago, including Sibenik archipelago and the wonderful National Park Kornati, which is a paradise for sailors. Within equally comfortable distance lies the larger islands off of Split: Hvar, Brac, Vis and Solta. There simple isn't time to do both routes within one week, but you may always choose one route and save the second for later. The difference of the routes are pretty much in character to the landscape of the islands and ports. The islands off of Split are larger and more inhabited with cozy, small towns and major ports. They are rich in culture, history and have a greater range of shops and restaurants, etc. 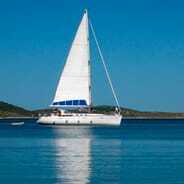 Sailing to the north of Kremik means sailing more in archipelagos and between small islands. The area is largely uninhabited except for a couple of smaller communities. 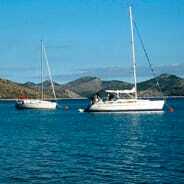 There are plenty of good bays for anchoring with small buoys and piers with fixed moorings. Almost all good coves have a cozy tavern serving delicious fresh seafood. The area has no fewer than two national parks, Krka and Kornati. 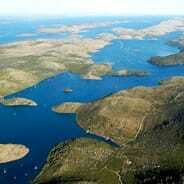 Kornati is an archipelago made up of islands and islets. 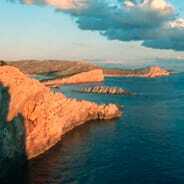 In 2009 the entrance fee to the Kornati National Park was 250kn if prepurchased at Marina Kremik. It is more expensive when buying on the spot in the park. If you are looking to spend quality time with family and friends while enjoying great sailing, swimming and wonderful cuisine, then this is the place for you. Opat is located on the southern tip of the island of Kornati in the Kornati National Park, and is a wonderful place with a cozy tavern serving good food with fresh seafood being its specialty. Here, as in most tavernas along the coast, you will be served organic, traditional food. Opat is a good anchoring bay and berth with fixed moorings. - Berth call the night before to provide the boat's name. - No port fees (provided that the crew eat at the tavern). - Free National Park entry. 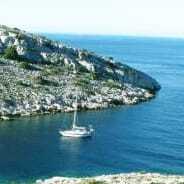 Zut is a nautical paradise and one of the islands in the Kornati archipelago. It lies between the islands of Pasman and Ugljan (which is linked to the mainland). Zut is a long, narrow island and covers an area of nearly 15 square miles and is at most 2 km wide. The highest point is 172 meters above sea level. The island is steep and protected by the coastline, which is characterized by the sheltered bays of Luka Hiljača, Sarušćica, Yellow and Bizikovica. From there, it feels far to all amenities and one gets the feeling of being on a deserted island. Zut is covered with fig and olive trees and has no permanent settlements. The island is used regularly throughout the year by fishermen, small-scale farmers and olive and fig pickers from the island of Murter. 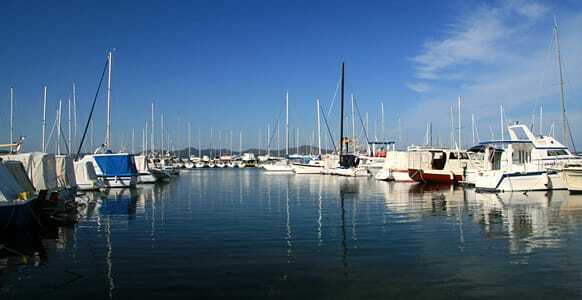 Zut island has a lovely marina and is complemented with a good taverna, Restaurant Festa. - Free entry to the National Park. Telašćica is a nature park named after the bay which is located in the southeastern part of Dugi Otok. The bay is about 8 km deep and 1.6 kilometers wide. In the Telašćica bay are 25 larger and smaller-sized coves and bays and 5 islets. It is well-protected against bad weather thanks to it's location. Telašćica is one of the largest and best protected bays in the eastern Adriatic coast. It consists of three areas:Tripuljak, Farfarikulac and Telašćica. The greater part of the bay's bottom is covered with groups of marine flowering plants, marine habitats, and an extraordinarily rich wildlife, which is essential for the reproduction of many fish species. In view of the beautiful nature we suggest enjoying your dinner on board. Ravni Zakan is a real dream place with natural scenery that is enchantingly beautiful. A beautiful little island with mini-communities on the southern and northern sides. On the north side you will find the tavern "Laurus" with its' small buoys that bob outside where you can moor your boat. 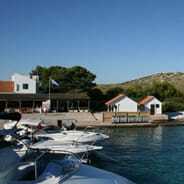 There is also a restaurant on the southern side and which is the largest in the Kornati archipelago. This restaurant is well-visited by cruise ships and can be quite full during the summer months. The food is absolutely excellent (but quite expensive). Our guests have the advantage of being able to prebook a berth without any fees, as long as they dine at the restaurant. However, the national park fee must still be paid. Have you seen the Oscar-winning movie Mediterraneo? Would you like to spend some time on a small forgotten island in the middle of nowhere. The only thing that exists on thia island is a small, sleepy fishing village that miraculously resists any signs of development in tourism. Kaprije is difficult to describe with words but is incredibly beautiful and innocent, especially during the early spring and late autumn, when the Adriatic sea is void of tourists. It is nothing less than complete amazement to wake up in a place with such breathtaking views. It almost makes you yearn for a much more primitive world and a life in greater proximity to nature. Having cruised around the Kornati and the Sibenik archipelago, it is now time to end the trip with a visit to the island Zirije. Here lies the beautiful bay of V. Stupice, which is a good bay for anchoring and which has solid even buoys that can be used freely. The bay is a wonderful, natural harbor with excellent protection and natural beauty. It makes for a perfect goal at the end to the trip. There is a restaurant in the bay where one can eat typical, homemade Mediterranean cuisine but the dining experience is not particularly enjoyable, which is why it might be a good idea to skip eating here if you haven't run out of supplies onboard. Sit on the boat instead and enjoy the food you make yourselves. The wonderful environment is of course still complimentary. On the last night it is common to complete the check-out procedure of the boat so that there are no commitments on Saturday morning, especially since transfer from the port to the airport often run early. After checking-out you might want to enjoy dinner at a cozy, local tavern.